Although Boundary Road Brewery isn’t actually a ‘craft brewery’, it wants us to think it is. That’s why it has released three new beers that don’t look too dissimilar to the stuff you might get from Garage Project or Funk Estate (I’ve already reviewed its ‘Powder Hound’ XPA, the ‘Chocka Riwaka’ Southern Pale Ale, and this is the third beer in the trilogy). 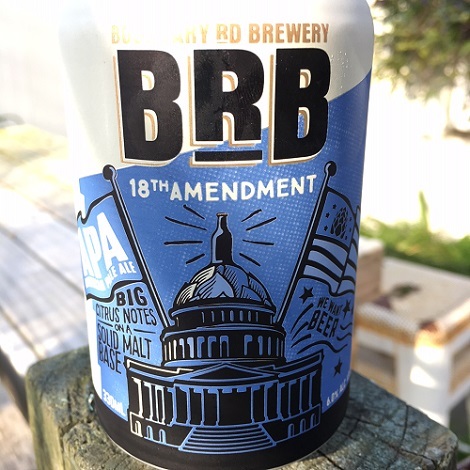 Blurb on the can: The 18th Amendment brought on Prohibition, which meant you couldn’t get a decent beer anywhere, unless of course you “knew a guy”. Brewed in honour of bootleggers, this APA is loaded with malt characters, citrus notes, all-American aroma hops and a crisp bitter finish. Enjoy it before someone makes fun illegal again. Tastes like: A surprisingly hoppy beer at just $11.99 for half a dozen, but as far as American Pale Ales go, this one is fairly tame at 6% and 57 International Bitterness Units. So, I guess that makes Boundary Road’s 18th Amendment a good gateway beer for inexperienced drinkers, but perhaps a wee bit mediocre for more experience and world-weary beer drinkers like myself. But it goes down okay – I certainly like it a lot more than Boundary Road’s ‘Chocka Riwaka’ Southern Pale Ale, which I hated – and represents exceptional value for money at that aforementioned price point. Beer/movie combination: If Boundary Road Brewery’s 18th Amendment APA was a Star Wars flick, it’d probably be Solo: A Star Wars Story. It’ll just leave you thirsty for Empire, but at least you’re not having to put up with episodes one or two, or The Last Jedi… those movies would be Double Brown, Export Citrus, and Tui respectively.